Former Secretary of State Hillary Rodham Clinton at the official release of the “No Ceilings Full Participation Report,” which coincides with the start of the 59th session of the United Nations’ Commission on the Status of Women on Monday in New York City. We’re now into Week 2 of the Hillary Clinton email saga, but if Martin O’Malley and his aides are huddled in Maryland somewhere hoping this hurts Clinton in 2016, all I can say is, “Don’t hold your breath.” Clinton continues to hold an almost unprecedented lead over her potential opponents for the Democratic presidential nomination, and Democrats may rally around her more fiercely as she weathers more incoming media fire. While some might scoff at the “Clinton Media Persecution Complex,” Democratic voters buy it. Remember when the Clinton campaign was crying bias during the 2008 primary? During that period, Democrats overwhelmingly thought the press was harder on Clinton than it was on then Sen. Barack Obama. While Clinton was secretary of state, from 2009 to early 2013, the view that the press was out to get her subsided. But since she left that office — and its nonpartisan glow — behind, the percentage of Democrats who see the press as being too harsh in covering Clinton has risen from 23 percent in 2013 to 54 percent in June 2014. Just 9 percent thought the media was easier on Clinton than on the average politician, according to that June poll. 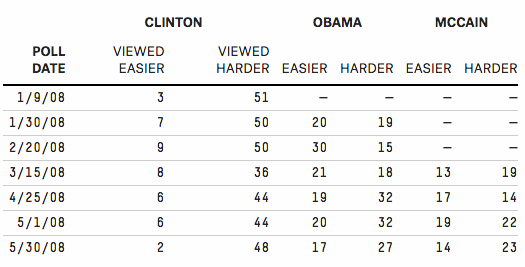 This 45 percentage point gap between “harder” and “easier” is similar to how Republicans felt about the press and Republican politicians, according to YouGov polls during the first half of 2014. In contrast, Democrats considered the press fair toward other possible 2016 contenders, such as Joe Biden and Elizabeth Warren. Of course, you rarely hear either Biden or Warren complain about the press. Biden is thought of as a sort of lovable uncle by most, and the media has basically been begging Warren to jump into the 2016 contest. It’s usually Republicans who rely on “media bias” as a political defense and GOP voters who think the press is gunning for their candidates. 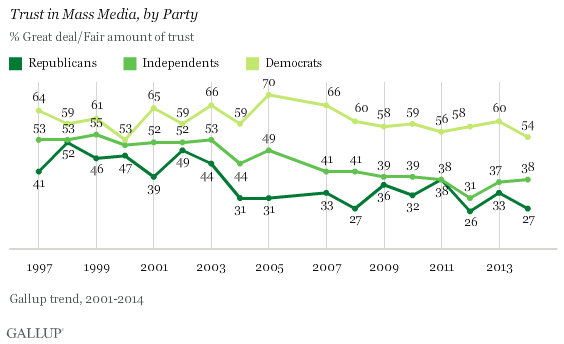 Democrats are more likely to trust the media. All of this makes it more unlikely that Democratic primary voters will care all that much about Clinton’s use of a private email account to conduct government business. Democrats are invested in the Clinton 2016 campaign, and even the liberal Democrats are with her. The more the press goes after Clinton, the more likely it is that Democrats will defend her.